Hoover is known for its vacuum cleaners, but also provides the consumer with carpet washers, hard floor cleaners, steam cleaners and air purifiers. 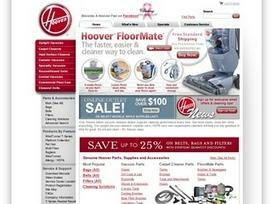 A shopper could also purchase parts and accessories for her Hoover product. Choose from upright or canister vacuums. Once a shopper determines which type of vacuum she would like, the shopper can choose from bagless vacuum cleaners or vacuums that use bags. Depending on the vacuum cleaner the shopper chooses, she can reap the benefits of multistage cyclonic filtration systems, wind-tunnel technology, power controls, and even automatic cord rewind so the shopper doesn't have to manually wind the cord. Onboard tools for vacuums include air-powered hand tools to reach small areas, a telescoping wand to reach under furniture and a crevice tool to get behind cushions and in other small places. Choose other features such as an upholstery brush made specifically for furniture and a hard floor tool so the shopper can safely vacuum hard floors without the power nozzle. If the shopper is looking for a steam cleaner, Hoover provides several models, including the TwinTank steam cleaners. These are designed so that they refresh and clean your entire home. Steam cleaner functions include an adjustable twin tank, so the shopper can clean surfaces with only steam or with a steam cleaning solution. Hoover's steam cleaners disinfect and kill harmful bacteria, staph and salmonella. The steam cleaner's flexibility allows the shopper to clean above-the-floor and floor surfaces. Depending on the model you choose, you could have up to 10 onboard cleaning tools to make your cleaning convenient, including a triangular mop head, triangle pads, a window squeegee, a garment steamer cloth, nylon scrub brushes, and more. Hoover also offers reconditioned equipment. One of the products with five stars is a reconditioned carpet cleaner. MaxExtract77 Multi-Surface Pro Carpet & Hard Floor Cleaner picks up a lot of dirty water so floors dry faster. It has counter-rotating brushes built specially for carpet cleaning, so that each fiber is cleaned from every angle. The user can also set the SpinScrub based on whichever type of surface she is cleaning. One of the best features of Hoover's carpet cleaners is the spill pickup mode. This applies only suction without turning on the brush. This is great for grabbing spills of all sizes. The motor also provides forced heated air so that the water stays hot while cleaning the carpet. Many carpet cleaners include a hose, an upholstery tool, a SpinScrub Hand Tool and a squeegee tool. Hoover's air purifiers come in several different models. Depending on the model a shopper decides to purchase, the air purifier may have a timer, a rinsable pre-filter, a charcoal filter, intuitive controls for easy adjustments and an a control system that determines what the air quality is and adjusts the speed of the fan for the appropriate dust level. Hoover's air purifiers have an LED indicator so the user knows when it is time to change the filter. The user doesn't have to try to remember when to change it or take the time to mark it on the calendar. Share what you think about Hoover, and your favorite ways to save there! Need a discount on the hose for my floormate.